Her tray has a cup with cocoa in a silver mancerina holder, and a glass of water. The most famous was Baker's Chocolate. The Massachusetts company was founded in 1780, and they paid to use the image, trademarking the design in 1883. Inside their 1919 booklet is this drawing of a tin of cocoa. 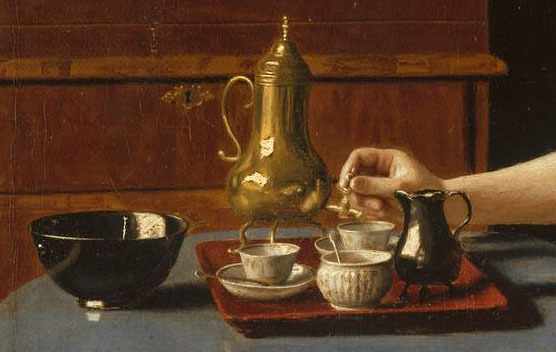 Liotard included a similar tray in "Le Petit Déjeuner" but this cup is in a saucer. Oh, and also check out her hair style with the little blue flowers. "A Lady Pouring Chocolate" (La Chocolatiere) by Liotard in 1744. The lady is turning the spout. 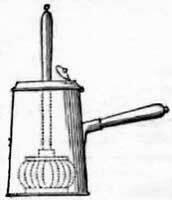 Generally cocoa was served in a pot with a spout near the top for the foam and a hole in the top for a molinillo to froth the liquid. Note the adorable hair style of the little girl in the painting. The title is unclear, one site called it "Madame Liotard and her Daughter." Great post. what lovely pictures!